Extensive compatibility: it can organize your phone, Apple watch, business card, pens or other gizmos. Suitable for all phones which are iPhone 6/7/8/X/plus, but also for Apple Watch, Samsung Galaxy S6 edge, S7 edge, blackberry and other smart phones. 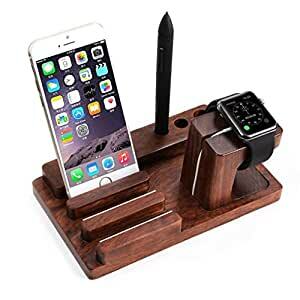 3in1 rosewood stand holder is designed for Apple Watch users, build with nature rosewood for modern homes to keep your desk clean and safe. It features with three extra docking space for mobile phones and tablets in two different angles, also a detachable charge holder cradle for Apple Watch. In addition, it has three holes, perfectly hold your pens in a good place. you can manage the charging cord for iWatch through the openings at the bottom of the iWatch dock, then if you need to charge your mobile phone or tablets, you need to put the device horizontally, and expose the charging port to get charged.? You manage the iPhone charging cable through the hole at the back. Also you’d better remove the thicker case when you hold the phone vertically.